What with all the fuss about the Channel 4 chicken welfare programmes, I suppose I should've got round to telling you about a trip Ben and I had to River Cottage in which chickens played a starring role. Way back last May, Ben had bought me a birthday present of a course at Hugh Fearnley-Whittingstall's River Cottage HQ. Early in December we drove down to Dorset for 'Hugh Cooks Christmas'. This was a cooking demo by Mr FW followed by the eating of the same meal that had been demo-ed. An atmosphere of fun and informality was apparent as soon as we arrived. Having been tractored down to the HQ we found ourself being briefed in a yurt while glugging a surprisingly alcoholic aperitif. The main demo room held about sixty people, in front of them the demo kitchen, complete with an enormous overhead mirror so you could see what was going on. At the back there was a a bar, astonishingly run on a cost-price basis. 'Twas clearly the season to be jolly. The demo was interesting enough. Hugh's an engaging, watchable performer . . . you don't need me to tell you that. I picked up one or two good tips and it was interesting enough, next time I'll go for something a bit more advanced or specialised though. He was trying to persuade us that it would be better value to buy two good quality chickens for a Christmas lunch rather than one larger turkey. So the main demo was about that. As well as that we were shown how to make venison carpaccio, devilled crab, mussels in leek and cider and a chocolate torte. With this kind of cooking, the ingredients come to the fore. When we tasted these later the huge advantage of good quality produce became startlingly clear. The canapes were just great. Smoked pollack rarebit . . . mmmm, had to go back for more. Merguez with paprika yoghurt. Nom nom, more please. Beetroot with creamed cheese. Just so much better than you thought that could be. Finally, a delightful smack in the face from the devilled crab. Hit me one more time. The demo room was reconfigured into a festive feast room and we sat down for the main meal. The seared loin of venision was melt-in-your-mouth tender and full of flavour, accompanied by a citrus dressing that made you note how good it was. The mussels were fresh and moreish. And what was most surprising about all of this? Hugh was still around . . . he'd been supervising all of the cooking and had stuck around until it all went out. I'd expect your typical celebrity chef to scarper at the first opportunity. When the chicken finally arrived it was getting pretty late and a Christmas-style meal wasn't quite what I needed . . . but the food was persuasive. The chicken was absolutely fantastic, succulent and firm in just the right measure. The star for me, though, was the River Cottage bacon, here cooked with brussel sprouts. That might well be the best bacon I can remember having. 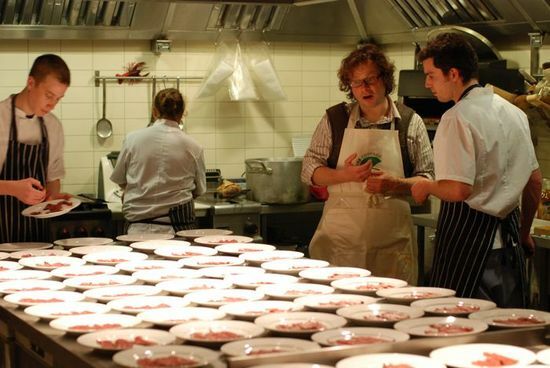 You can find out about River Cottage events here. I thoroughly recommend a vist.